What’s Small but Terrible? It’s Cherry Mobile’s P8! Amid the people crowding and drooling over big and technologically advanced cellular phones from giant companies, my friend and I showcased our uniqueness and went for the small and cute, yet surprisingly capable one from a starting local firm. It all started when my friend-slash-officemate came to my place at work and excitedly told me about a cute phone she saw the other day that she thought would match our unique taste. 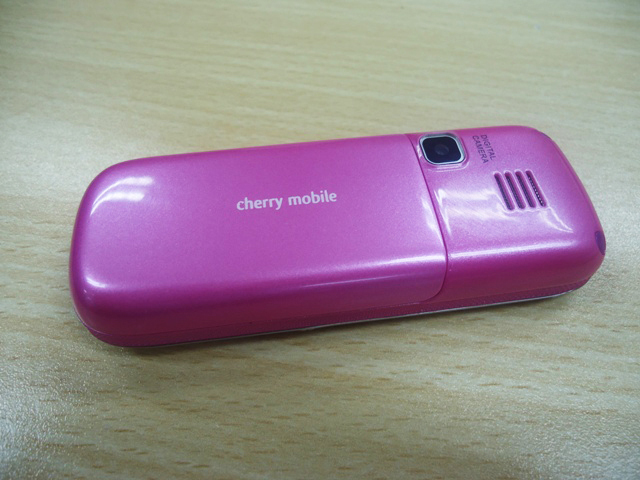 It was the Cherry Mobile P9 and we searched for it on the Internet and it really was cute and totally inexpensive. We promised each other we would buy one each as part of the signs of our friendship, but on our next pay day because it wasn’t part of our budget as of then. Then came weekend and we went to one of her cousin’s home and saw her niece’s phone which looked like the one we ought to buy soon. We borrowed it, placed it on our palms and got impressed with its size, then checked its features out, and since then we couldn’t get it off our minds. 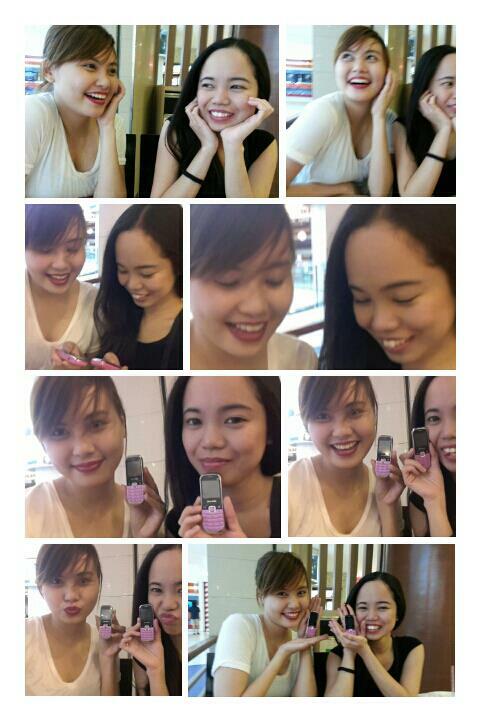 So when Monday arrived, we looked for the phone in Eastwood during office lunch break, then SM Megamall after work. It was quite a frustrating hunt, with every store had it out of stock, until we saw the Cherry Mobile booth in SM Megamall’s Cyberzone, and then YES! We saw our perfect phone! Not the P9, though, but P8 which is actually better. P9 looks like a calculator, while P8’s like a toy but really, really cute and more of an eye candy. Cherry Mobile’s P8 is a tiny gadget packed with goodies. At the price of 1,199 pesos, you get a dual SIM phone that is also MMS, WAP, and GPRS capable. Then though its colored LCD is only 1.44 inches, its user can still view photos taken from its 1.3 MP camera and if one wants to, can transfer them to a computer since P8 also has a Micro SD slot that can accommodate up to 4GB! And the camera has options for: photo size, night mode, brightness, contrast, exposure, white balance, and effect. Nice, huh? Not only those, who would’ve thought that such a small phone has Bluetooth, FM radio, can play audio and video, and even record voice and video? Almost everyone I showed it to in the office find it really impressive and one even already bought her own. And with all the dangers on the streets expensive phones bring their owners, Cherry Mobile P8 offers no risk at all. I can wave mine freely everywhere without any fear that some bad guy or two would take it away from me. I’m too confident about this since I don’t think snatchers would sell their souls to the devil for such a price. hehe. It’s also available in various colors: pink, blue, white, black, green, grey, white, and yellow. Now there’s a downside to everything. 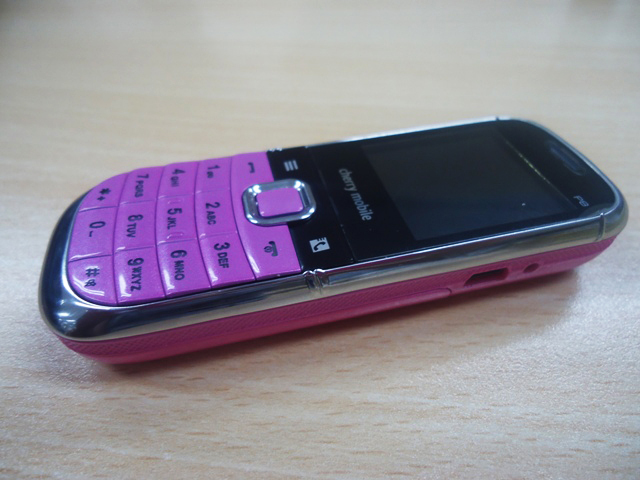 Due to its size, this phone is not advisable to people with big thumbs ’cause they’ll surely have a hard time with it. And the keypad isn’t QWERTY, which means if you are to type letter O, for instance, you will have to click, click, click on key 6 first to get it, then click, click on key 9 for letter X. When it comes to sounds, P8 is quite decent until you listen to music through its earphones–Errr… That is if you have ears like mine, that which is sensitive when it comes to what has good quality and what hasn’t. But if your ears aren’t, I guess it wouldn’t be a bother. And if you’re into applications, obviously this isn’t for you. In fact, I think I have decided to make this my phone because I have an Apple iPod Touch, and only the SMS-sending capability is missing in it, so P8 is the perfect fit for that gap. Established in 2009, Cherry Mobile is fairly new to the local IT business but it already managed to snag the IT Company of the Year award at the 2010 CyberPress Awards. It does have an organizer, specifically, on its Extras, are the alarm, calendar, calculator, world clock, unit conversion, currency converter, stopwatch, timer, and e-book reader. Yes, you can save on its calendar (up to 50 characters Subject), and no, it doesn’t have a blacklist option, only barring of all incoming or outgoing calls. Looking for software support for my P8 and found this instead. nice blog! After my touch screen phone (with lots of features I don’t use) was lost, it was a relief to get hold of the CM P8 (mine is Fire-Red). I have very limited needs for a celphone, just dual-SIM for texting/calling, portable music and a mini-SD to store/play Gospel songs as reference for our music ministry’s practice – and P8 has more. The mini-USB connector makes transferring music from my netbook hassle-free; and Bluetooth is also included for spur of the moment transfers. The Extras are also appreciated knowing I have them to use. Sound is not as great as an SE (Walkman) phone, in fact sound from the headset is not good, but using mine with an old Alcatel headset (from my defunct OT-C825), sound has improved. But what really attracted me to the phone is the cutie size – not heavy to the neck, and not bulky either especially when I go cycling – and looks durable compared to the thin models that you’re always afraid to drop; I haven’t tested it though :D. So if you drop yours and it hasn’t disintegrated to pieces (pardon the redundancy!) – love to hear it. CM P8 is indeed cute. In fact, most people who have seen mine just can’t seem to get enough of its cuteness that they can’t stop themselves from borrowing it, trying to type on it, and expressing how they find my gadget extremely cute again and again. Hehe. after loosing my mp3 player, i saw this phone and thought it would be an excellent replacement. good review po. im more concerned about the sound quality, more than anything. you mentioned the sound as a con, could it be because of the headphones lang? would the sound quality change if i use better dj headphones? The sound quality of CM P8 is good until you use its earphones, so maybe it’s really just because of the CM earbuds. But the thing is, if you look at this photo, https://wordsofhappinest.files.wordpress.com/2013/03/dsc05263.jpg, the rectangular thing at the side is where the earphones, as well as the travel charger, is connected so it’s not compatible to all kinds of earphones/headphones, unlike those of iPods and other cellphone brands. I don’t know if there’s supposed to be an adapter for it that can make it accommodate other earphone brands, though. But if you look at the comment of tata trumata above, you’ll see that she is able to use her Alcatel headset on P8, and maybe it’ because the two have the same kind of jack or something. ouch. thats a bummer, maybe i would need to look into the phone personally at their concept stores. anyways, thanks a lot. at least i know what to expect. Hehe. Yes, I guess for that matter, it’s really best to ask a Cherry Mobile sales person. I’m really thrilled by the features of CM P8, especially its compact nature, and would like to have one as soon as possible. But I’ve got some bit of a problem. I’ve searched stores here in Germany, including online stores, but couldn’t find any. Could you please refer me to any of your stores in Germany or any website where I can place orders? Hear you soon please! It’s great to hear that you like the features of CM P8. 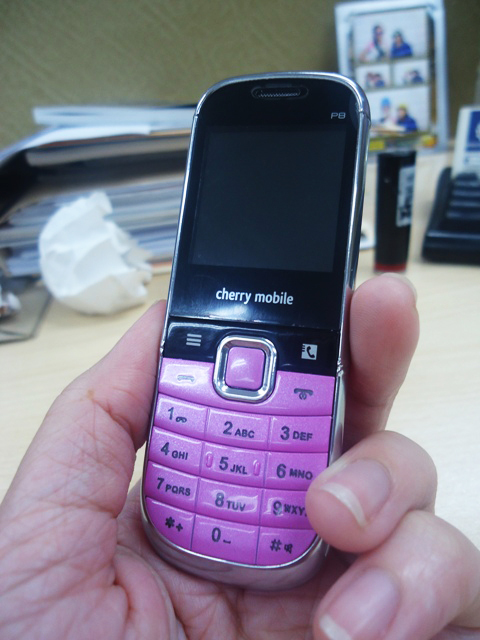 Sadly, as a Philippine brand that’s still new in the market, Cherry Mobile is only available in the Philippines. I also checked its website at http://www.cherrymobile.com.ph and found out that its products cannot be bought online. I’m sorry for this. Hello can i use p8 phone abroad? How about its battery life? I am mainly concerned about that. Because I have CM p1 before, loved it so much for its cuteness, but battery barely lasts a day. My dual sim phone is broken and I need a replacement. My phone now though, takes days to drain the battery. Not bad at all. I’m curious about the p8’s battery life. If it’s good, I’d buy this. I’m not much of a texter, but the battery life of mine last for days even during times when I use it almost the whole day. It gets exhausted easily when calling but it’s normal for any phone. Hope my answer helped you. Do you know how to use the ebook reader, or what file type (pdf, epub etc.) does it support for ebooks? Cherry Mobile P8 has an option for ebooks, but I’m sorry, I don’t know the answer to your question. I haven’ t tried it since this phone has a very small screen and I didn’t consider reading books from it. Hehe I apologize. How to transfer pictures from Cherry mobile P8 to computer? hi there! just asking namamatay-matay ba itong cp na ito? bumi kasi akong ng isang cherry mobile na small phone din, ibang model, namamatay-matay kasi. at maraming ibang customer na pumupunta sa service center nila dahil nga patay2 ung cp nila (iba2ng model pa talaga). Hi.. How many messages can be stored in the phone’s memory? Thanks! Unfortunately, this phone of mine was stolen almost two years ago and I can’t remember now the amount of messages I used to store in my phone.But as far as I can remember, the number is fairly okay if you’re looking at the standard of non-threaded inboxes. Hi! Did you like this blog? Enter your E-mail address below to follow and receive notifications of its new posts in your E-mail! "Happiness can be found in your own backyard." Doctors Don't Just SAVE Lives. They TOUCH People's Lives.